A large crowd made the long journey to West Cork for the first running of the Bay Run, a half marathon from Glengarriff to Bantry. The square in Bantry at 8.30 on a dull overcast but mild morning was a hive of activity as competitors made their way on to a fleet of coaches that brought them along the race route to the start line in Glengarriff. Everyone got to see what was ahead of him or her on the tough undulating course. Competitors were lined up for the 10am start in good time and just before the off the organisers got Ray Darcy (Today FM DJ) who was also competing to say a few words to the crowd. One look at Mary Sweeney had him complimenting her on her tan and inquiring where she got it. Starter for the day was well known Skibbereen athlete Tommy Murphy a medal winner at the recent European Vets Championships. The course itself was tough with the hardest part being the long climb out of Glengarriff but other pulls especially towards the end made for a testing run. It was well stewarded with marshals at every junction along the course. There was approx 680 finishers and the seven Eagles that ran were, Norman Kelly who ran a PB of 1.22.45 to finish 10th, Joe Murphy 1.28.09 (20th), Martin Fogarty 1.28.56 (23rd), Pat Murphy 1.30.10 (26th), Mike McGrath 1.31.29 (31st), Declan Daly 1.38.50 (78th), Kevin Phelan 1.49.39 (176th). At the finish a team of physio’s worked hard at driving more sweat out of you than was used on the run. It’s a race that you can expect to be on the calendar again next year. Road, Cross Country, Track & Field, Mountain running, Eagles have been there, done that, got the Tee Shirts. Now added to the list is Beach running. 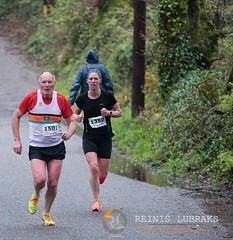 A new race on the BHAA calendar this year was the “Stride by the Tide” in Redbarn. Fifteen eagles were among the 202 runners that took part in the 4 miler that consisted of a couple of times around a loop marked out on the beach. The view of the majority afterwards was that it was a thoroughly enjoyable novel event and would look forward to taking part again next year. Rhona Lynch continued her impressive form this year by winning the ladies race in 25.02 while Fidelma Kirwan and Fiona O’Riordan were 2nd and 3rd O/35 with Monica Twohig 2nd O/40. Best of the eagle men on the night was Padraig McDonnell in 23.48 while John Desmond was 2nd O/40 and Denis Carroll 1st O/45. Those people heading off on sun holidays will be expected to put in some serious beach sessions. Redbarn this year and whose knows next year it could the Copacabana. The house was booked, the food was bought, the race numbers received, the scene was set. 6 of us landed on Friday night to Ballyconnelly and socialised late into the night talking about running, triathlons and lots more besides. 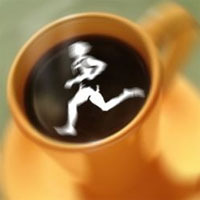 Saturday was a quiet day with the runner’s drinking water and mentally preparing for the race. The Yanks (Marissa, Joe and Baby Nico) arrived on Saturday for more support. Sunday morning arrived with the weather looking a bit suspect but the humour was upbeat. I was the team driver to Leenane and asked when passing Clifden Church did they think I was on the right road, all paused and agreed we were. It seems however we weren’t and we had taken the route of the Ultra Marathon and Marathon. We passed Gerry Forde en route to his 100th marathon. 4 women (Cork, Monahan, Scotland and South Africa) shouting at him, the poor man didn’t know what was happening. We marvelled at Ultra Marathoners who looked calm and collected at 20 miles. We passed some fellow Corkonians who were doing a marathon, they too got the UN shout. We arrived at Leeane at 11:45 (not much time to spare), the girls hopped out and I headed to on. Approx 1500 lined up for the 1/2 marathon, a nice hill at the start for 1 mile and they were off. I caught them at the 6 mile mark, Sheila and Loretta looking happy and Jane very happy that the injury was holding up. 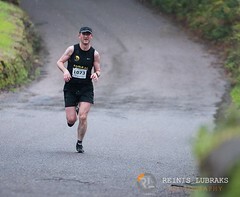 , A spectator who was clapping and encouraging was a welcome sight for the sometime lonely roads of Connemara. I met them again at Joe Keanes pub, approx 10 mile mark all still intact and looking comfortable as they headed for the ‘hell of the west’ I had heard about his hill but when I drove it and saw runners both Marathon and 1/2 Marathoners at this stage I thought it was aptly named. I met de lads and de yanks at Maam Cross. It was packed with people, tents, runners, Gardai and a commentator in a box that was straight out of “de unbelievables.” The eagle team came home looking strong and happy. The support team gave them a big shout and they were happy to be finished this race. Celebrations followed in Clifden. Well done girls – you did us proud! The Munster Road Championships were held in Banteer on Sunday 19th. Weather conditions were dry but cold and a little windy, however the pre-race cold proved not to be as bad as it seemed once the race got going. The course was over the usual circuit in Banteer and comprised of 2½ laps over flat terrain, for the men. Road surface was fair, with a troublesome camber on about 1/3rd of the circuit. The men’s events were combined into one race, with some members competing in both Novice and Masters events. Unfortunately Eagle didn’t have a ladies representative at these Championships also, for the first time in a very long while, Eagle didn’t have a team in the Masters category, as forced withdrawals on both the M35 and M50 teams meant that we were short one on each team. Joe Murphy and John Quigley could have dropped down from the M50 team on the day, however, in the event, Eagle still would not have placed in the medals for M35 teams. The Novice championship saw Padraig McDonnell continue with the fine form he showed recently in Ballycotton, finishing in 26th place in the Novice and 35th overall, in a time of 21:46. Our second finisher was Dave Muldowney, 41st Novice and 52nd overall, 22:28. Next came a trio of Eagles, Denis Carroll, John Desmond and Norman Kelly, in 57th, 58th and 59th places respectively in the Novice and 69th, 70th and 71st overall, 23:17, 23:19 and 23:22. Joe Murphy was our 6th finisher, 65th Novice, 78th overall, 24:07. John Quigley was 7th man home for Eagle, 78th Novice, 94th overall, 25:02 and Laurence Courtney was the anchorman, 80th Novice, 100th overall, 25:51. An Riocht won the Novice, 45pts, Togher were second, 75 pts and West Limerick third, 100pts. Eagle finished 8th, 182 pts, just 8 pts behind local rivals St. Finbarrs. Dave Muldowney was our only medallist on the Inter-County Novice team, where Cork finished third. The Cork team, in all events, was selected strictly on the basis of performance in the recent Cork County Road Championships. As a consequence of this, Cork may have been denied the gold medals as a team, as several of the first Cork finishers, including Padraig McDonnell, were not included on the Cork team. Cork were third on 130pts, behind Limerick, 96pts and winners Tipperary, 93pts. The first six Cork over the line would have scored 65pts. John Desmond also secured a Bronze medal, on the Cork M35 team. This time Denis Carroll lost out on the team, having finished behind John in the County Championships. The 29th Ballycotton 10 took place today. Weather condition were fine, if a bit cold, except for a short hail shower during the first few minutes of the race, however a strong steady breeze made running a little difficult during the first 5 miles or so, until the turn for the return journey. It could have been worse, as weather forecasts earlier in the week predicted very wet conditions. As a result of the wind, many of the runners’ expected times were back a bit. However this didn’t stop some Eagles posting very fine times indeed. Our top trio even managed to gain the Club it’s first ever team prize in this prestigious event! !In light of the massive 4,279 entries, there had been much speculation about the race start. Any apprehensions were quickly dispelled when everyone got into their stride very quickly. First Eagle home, was predictably Wieslaw Sosnowski. Wieslaw finished in 13th place in 54:21. 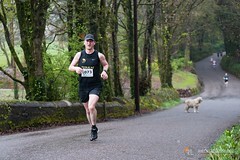 Tony Kelleher, currently in training for a Spring Marathon, was our second scorer, in 34th place, posted a fine 57:23. 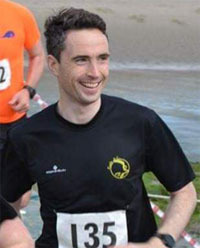 Padraig Mcdonnell was our third scorer in 56th place, 58:42. St Finbarr’s were first team with 48 points and the Eagle trio, with 103 points, secured the second place on tie break. I was so delighted on hearing the Eagle team name being called out that I didn’t catch the name of the third placed team. Finbarr Kirwan, who now runs unattached, as “Bray”, was 26th, in 56:28. There was further good news for Eagle, though incognito. 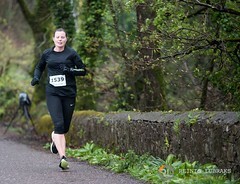 Rhona Lynch who recently transferred to Eagle, was 9th lady, 63:45. Rhona ran under the banner of her former club, UCC, for the event. Under AAI transfer rules, Rhona isn’t eligible to run for Eagle for 30 days after transfer, so it’ll be a number of days before Rhona can officially run in Eagle colours. 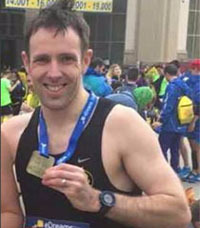 Fergal O’Leary, who often trains at the track at the same time as Eagle, finished in 105th place, in 60:48. Jeez Saturday was a pet day, if they get a day like this tomorrow it’ll be great. But I suppose to be fair the weather for Ballycotton is always pretty good anyway. The phones are busy all day, people checking in with each other, “how’re ya feeling?”, “I think I’ve a bit of a cold coming on, but I should be okay on the day, I hope anyway”, “don’t worry bout it, you’ve the training done, you’ll be fine”, “see ya tomorrow”. The morning arrives, beautiful bright fresh morning. I head down to Gail’s place to pick her up, Derek and his friend are giving the joe job of entertaining baby Mathew for the day, but they’re hoping to sneak in a game of indoor football if they can get a baby sitter for an hour. Off we head, and the traffic flow is excellent, Tom Hartnett was out there with his traffic management team, keeping the whole thing rolling, I often wonder on Ballycotton race day, is there a few Tom Hartnett clones around, he’s every where, out on the roads keeping the traffic flowing, at the start and finish line, you’ll even see him picking up rubbish long after all the runners are gone home. We’re directed to the nearest car park, well it’s a big field really, with a few guys pointing you to the next available spot, but it works. We meet Kevin S and Fleur, every thing good so far, onto the bus and we get our free ride into Ballycotton. We take the short walk up to the Marquee and hang around chatting to anyone and everyone. Danny McCarthy (Midleton AC) and his boys are ready for action, we meet Noel Berkely (The King of Ballycotton), Noel’s doing the race commentary today. We move on up the Village for the prearranged Eagle AC group photo, 12:00 o clock at the Church gate. It turns out that most of our runners are still on there way from the car parks, we wait a while, but Mark (official race photographer) has to go and get set up for a long afternoons photography, (check out http://www.picturethis.ie a fabulous days work). Mark takes the photo of 15 or so of us, a beautiful looking bunch I tell ya. And now the countdown begins. Runners are now getting into the zone, doing there own little pre race routines, warm up, stretching, toilet, thinking “I must get a good position at the start”. I’m not running myself this year so I’ve volunteered to do a bit of stewarding. I’ve been told to look for Niall outside the Marquee at 12:30. “ Hi Niall, I’m Joe from Eagle AC”, Niall introduces me to the rest of his crew, he’s a very laid back character, he’s looked after a certain section of the stewarding for several years, so he’s very relaxed about it. He hands us all an orange plastic bib with Race Official written on it, I’m thinking, I’m not wearing that thing, but they all but on there bib, and I can see Niall looking at me as the odd one out, so I throw it on. I might hang onto it, and see if I could use it to get into a gig like Oxygen or the Electric Picnic, “let me in, I’m a race official”, I can hear the reply already “feck off ya eegit”. Anyway, Niall briefs us on our gig, which is basically, keep the road clear for the race start, which was kinda easy, you’d want to be pretty stupid to stand out in front of 3000 runners, trying to navigate there way down through the village of Ballycotton. And then for the finish, make sure that the runners have a clear path and are not impeded by those who have already finished. Due to the increased numbers, the race start was delayed by 15 minutes, so at 1:45 the gun sounded and they were off. Wieslaw, Tony, Padraig, Rhona, Kevin, Joe Murph, David Muldowey, you can’t possibly spot all your guys, 3000 runners, some with fierce serious faces, others smiling and waving. Keep clapping and shout at those you spot. Strangely enough, on such a fine day, a minute or so after the off there was a brief hail stone shower, and as quick as it came it went again. Very quickly the Village went from being thronged with runners to being almost empty, just spectators and stewards. In the distance you could still hear Noel Berkely’s race commentary, Vinney Mulvey, Cian McLoughlin, Alan O Shea, Sandis Braltis, were the lead group, followed by, Neil Cusack, Cathal O Connell, Ian O Leary and our own Wieslaw. We pulled out a few barriers in order to funnel people in the right direction after finishing their race, and then we just waited. I was getting race updates over the walkie talkie, and it became clear after 4-5 miles that Mulvey had the race pretty much wrapped up. Less than 50 minutes later and here comes the Garda car and bike, followed by the race commentary van, followed by Vinny Mulvey, he was hopping off the road, an easy win for the Mullingar man. Wieslaw was our first boy home, I don’t know how he manages it, but he always looks so relaxed, Tony was next, after having a flyer. Tony’s had more than his share of bad day’s in Ballycotton, so this great effort was long overdue, and sets him up nicely for the upcoming Rotterdam marathon. I’d been talking to Padraig before the race, and he had some concerns about cold symptoms, no need for concern, he was our next athlete through, not looking as relaxed as Wieslaw (I tell you, it’s not natural to look that relaxed) but flying none the less, and crossed the line in a new and huge pb of 58:42. Then it dawned on me, “I wonder will we win the team prize” but then I realized that the Barrs had Cathal, Ian O Leary and Trevor Woods all running blinders. As it happened Eagle took second place team prize, which was fantastic. We only had the three runners under the hour this year, a very strong head wind for the first five miles definitely pushed Declan Doyle and David Muldowney outside the hour mark, great running none the less. And not too far behind, and on the back of almost no training was Ger Dunlea, and boy was Ger working hard coming up through the Village. At this stage it was hard to keep an eye to our club runners, as I was beginning to get busy with the job of stewarding, but I was still able to spot another few fantastic performances, Pat Twomey floated up the hill looking strong, shortly after Pat I spotted Rhona Lynch, obviously after running a blinder, Rhona’s preferred distance is 4 – 5 miles and cross country, this was her first real crack at a ten mile race, she picked one of the toughest and totally nailed it crossing the line in 63:45, 9th lady overall. A little further down the road we had another one of our girls running another flyer, Gail less than a year after the birth of Mathew, back running a few short Months and she crosses the line in a pb of 71 minutes and change. Not that far behind were Bridget Liston (first time over the distance I think) and Colette Garvey, being her usual steady self. For the next 25-30 minutes it was none stop, wall to wall runners, some looking more strained than others, but all with a common goal, crossing that finish line. My gig was pretty straight forward, I just kept shouting into the loud hailer “keep to the left runners, the road is clear on the left”. I go the distinct impression that some of them were thinking, will that gobshite ever shut up, although I got the odd friendly wave as well. Obviously everyone who ran up the Village, had to walk back down the Village, and despite some being more exhausted looking than others, most everyone had a very satisfied look about them, whether it was their first Ballycotton 10 or their 21st, it was one more completed. We hung tough for the last of the competitors to finish, I met Mark (race photographer) at the finish line, who between himself and his assistant had managed to take approximately 2000 photos, impressive work. I think I felt more tired than if I had actually ran the race. We had a bit of tidying up to do, and it was all over. Being a steward today, I got a chance to see up close the Ballycotton Race Promotions team in action, they’re an amazing bunch to pull off this race each year. There is an incredible sense of community about them, they’re all focused on ensuring that their race, runs as smoothly and as efficiently as is possible. Back to the bus, back to the car park, back to Cork, into Wagamamas for much needed nosh (I was starving), into the Idle Hour where a big gang of Eagles had gathered, and had a nice lash of porter, mixed with plenty chat and even a bit of dancing. The 2006 AAI Cork County Novice and Masters Road Championships were held in scenic and sunny but cold and windy Lisheen, near Skibbereen on Sunday Feb 26th. The Novice and Masters races were held as separate but single events for both men and women, however the ladies had the complication of the small numbers in the U-19 men who also started with them. The men were off first on a 4 mile circuit over open and hilly terrain. Surface was mainly good but a bit rough in spots – “green line” up the middle in places, with local spots of gravel and two steep downhill sections. The strong cold wind appeared to be against us most of the way round the course and the open terrain offered little shelter, still, it was the same for everyone. Eagle reps on the day were Niamh Roe, Dave Muldowney, Norman Kelly, Martin Fogarty, Denis Carroll, Joe Murphy and John Quigley. Eagle supporters included Anne-Marie Healy, Liam Docherty and Pat Murphy. Eagle had a team in each of the Mens’ categories, with everyone except Joe Murphy counting in the Novice – Joe is out of novice on the road, having previously scored on two winning teams. On the Masters side, all Eagles counted, except Dave Muldowney and Norman Kelly, who haven’t yet entered the Masters category. It was clear before the start that Togher would be the main threat and so it proved, with Togher filling the first four places, giving them a team score of the minimum of 10. Former Eagle member, Javier Garcia, running as Arijav Cragia, won the event. Eagle were second team, on 36pts, with St Finbarrs third on 58pts, and Rising Sun next on 71pts and home club Skibbereen on 97. Eagle places were 6, Dave Muldowney, 8, Martin Fogarty, 10, Norman Kelly and 12, John Desmond. In the Masters event, expectation was that St Finbarrs would, as usual, take the premier spot, however it became apparent that the Barrs were fielding a depleted team on the day, however there was plenty of competition from Rising sun, Bandon and Skibbereen. 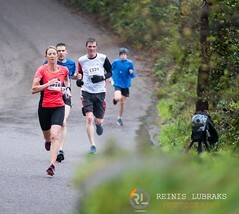 The hilly terrain ensured that sprinting was out of the question (speaking for myself at least!) but strong packing by the Eagle squad ensured that the County Masters title resides at Eagle for the next twelve months. Eagle scorers were Martin Fogarty, John Desmond, Denis Carroll and Joe Murphy, with a score of 35pts; 6,8,9,12. A tight finish between Bandon and home club Skibbereen saw Bandon take second place by the smallest margin, on 47pts (3, 4, 17, 23) to Skibb’s 48 (5, 13, 14, 16). Rising Sun were fourth on 51 (7, 10, 15, 19) and the Barr’s 5th on 61 (2, 11, 21, 27). Denis McCarthy of East Cork won the event. Eagle had good success in the categories also, with John Desmond, 3rd M40, Denis Carroll, 1st M45 and Joe Murphy 3rd M50. For the second time in succession Niamh Roe was our sole representative in the Ladies Novice. Unfortunately Eagle had no representative in the Ladies Masters. Niamh finished in a very creditable 9th place in the Novice. 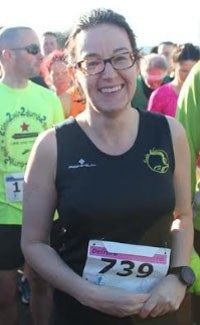 Jennifer Goggin of Leevale won the event. It is a pity that teams could not be fielded in either Ladies event as there were “easy pickings” available, with the Barrs making the most of Eagles absence. The Barrs ‘A’ won the Novice, 18pts (2, 3, 6, 7), with Banty 2nd (3 scorers: 5, 8, 13) and Barrs ‘B’ third (3 scorers: 10, 11, 12) Two more Eagles would have challenged for silver, three more would have given Eagle silver outright. The Barrs fielded a strong squad in the Ladies Masters and duly took the first two team places on 10 pts: 1, 2, 3, 4 and 32pts: 6, 7, 9, 10, with Bantry third, with three scorers: 5, 8, 12, so, by default, an Eagle team of 4 would have taken Bronze in the Masters. Carrigaline 5. 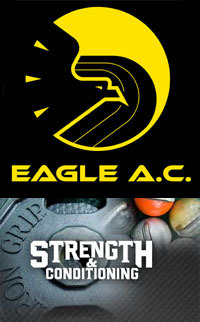 Promoted by Eagle AC. 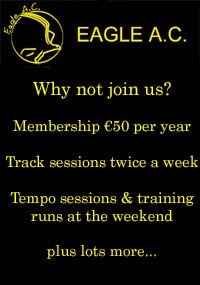 Sponsored by Carrigaline Physiotherapy & sports injury clinic. 11am on a dry & crisp February morning and 202 runners lined up for the start of the 2006 Carrigaline 5 mile road race. Tom Carey (West Limerick AC) showed his eagerness to win the event as he broke from the starting line. Tom led through the first mile in 4:47; the chasing group was made up of Roy Fahy, Cathal O Connell, Wieslaw Sosnowski and Tony Kelleher, who went through the mile mark in 5:13. Tom Carey increased his lead the whole way, going through mile two in 9:54 and mile three in 15:15, steady as you like out to mile four in 20:26, with a final push for home when he crossed the line in 25:20, an excellent time, and a very convincing win over a testing course. Meanwhile, Cathal O Connell (St Finbarrs) had broken away from the chasing group just before the two mile mark, and held his second position all the way and crossed the line in 26:19. The battle for third place was closely contested between Roy Fahy (East Cork) and our own Wieslaw Sosnowski, but Roy had the speed to overtake Wieslaw, coming in to finish third in 26:48, Wieslaw’s finishing time was 26:53. There was a large gap between fourth and fifth place finisher Kieran O Sullivan (St. Finbarrs) who crossed the line in 28:00 flat. Michael Dunne Jnr (St Finbarrs) was next followed by Philip Whiters of Duhallow. Rosmary Ryan (Bilboa AC) mirrored her boyfriends (Tom Carey) effort being the first lady to cross the line in a fantastic time of 28:10. Lucy Brennan (Sligo AC) was second lady in a time of 29:58, closely followed by our own Rhona Lynch, who’s enjoying some very good form early in the season. Fourth & fifth positions went to the ever steady Carmel Crowley and Mary Sweeney. Kieran McKeown & Bridget Liston. Twelve Eagle competitors made the long journey to Boyle, County Roscommon last Weekend, to take part in the National Intermediate and Masters cross country championships. 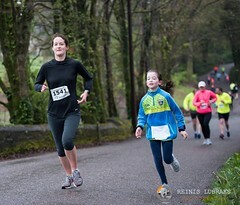 The races were held in the beautiful Lough Key Forest Park, on Sunday February 5th. While weather conditions were dry and mild for the races, the underfoot conditions were tough and demanding, to say the least. The first race was the Masters Women. 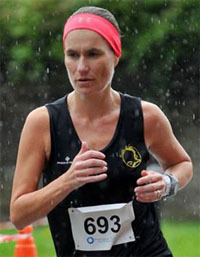 Ann Marie Healy, Eagle’s only representative in this race and running for the Cork F40 team, got off to a great start, and was well positioned in the leading group as they headed out on the first lap. While losing some ground in the middle portion of the race, Ann Marie ran well to finish 17th overall, and 11th in her category. 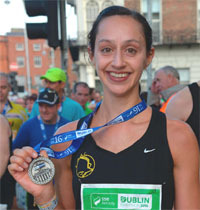 The race was won by former Olympian Pauline Curley of Tullamore Harriers AC. There were 106 finishers. In the Masters Men’s race, which was to follow, Eagle had Pat Murphy, Pat Twomey Joe Murphy and John Quigley running on the M50 teams for both club and county. All credit is due to these individuals who mix it with the best in the country taking on all conditions to continue representing both club and county year after year. The team was led home by Pat Murphy. 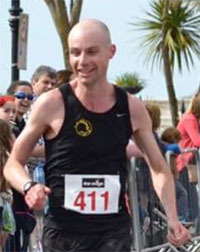 In the M40 category Andy Gibson, was our only competitor, but was also a member of the Cork M40 team, fought bravely throughout the race, in spite of an injury which made him a doubtful starter before the race. The first ten miler of the year, the Waterford Crystal Dungarvan ten miler, took place on Sunday February Five last. It was a good day, cool, cloudy and windless. 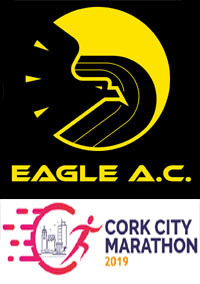 The Eagle turnout was small due to a clash with the Cork BHAA fiveK in Mahon, although at least one club runner, Mick Dooley, ran both in respectable times. 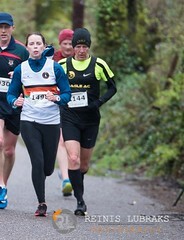 This left the remaining Eagle runners, all 18, with just Dungarvan to concentrate on. The race was won by our friend Sandis Bralitis in the magnificent time of 50:08. First Eagle home was Wieslaw (Sosnowski) in fourth place with a time of 54:23. Tony Kelleher was next home in a time of 57:52 and in 17th position. Dave Muldowney was third Eagle home in a magnificent time of 59:33 and an overall position of thirtieth. Following Eagles were Denis Carroll, Norman Kelly, who just piped Pat Twomey in a time of 1:01:56, Martin Fogarty and Mike McGrath, who did a great time of 1:05:29 to secure 99th position. Golf is obviously a wonderful form of running training! A small number of approx. 70 runners took part in the 2nd annual BHAA X-C, held in Beaumont Park. The 5k course was run over one big lap and two shorter laps. Going was good, if a bit slippery in one or two places, particularly on a steep section coming up from the Beaumont drive side of the course. Heavy overnight rain meant that the course muddied a bit at the turns but otherwise was on good grass throughout. Just six Eagles took part: Pat Twomey, Michael Dooley, John Quigley, Eddie Byrne, Derry Casey and Monica Twohig (hopefully I haven’t missed anyone out. First Eagle home was Tony Kelleher, 29:05, in 18th place. Tony was “taking it easy”, as he is still suffering from shin problems. Denis Carroll was next best, 15 secs and 4 places further back, as 3rd M45.Dave O’Callaghan, 2nd M40, was just under 30 in 29:57 (27th), followed by Dave Muldowney (31st, 30:21) and Martin Fogarty (3rd M40, 33rd, 30:33). Pat Twomey had another fine run to take 1st M55 in 30:49, 36th. New member Andrew O’Driscoll came through strongly to finish 43rd, 31:53. Joe Murphy, in spite of “pulled my hamstring during the week” came through strongly to get the better of John Quigley in the last 400m, finishing in 50th place, 32:24, with John one second behind in 51st place. 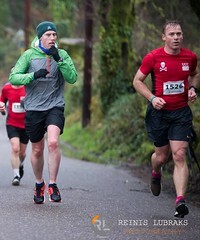 Kieran McKeown ran the course with Brighid, both crossing the line in 35:08, in 69th and 70th places.